Welcome To... - life. photos. scrapbooking. That's right people... I'm dedicating this week to one of my favorite things. As many of you know I absolutely love this dressing and the folks at the Gazebo Room company were nice enough to send me a hefty supply to give away to many of you! SO! 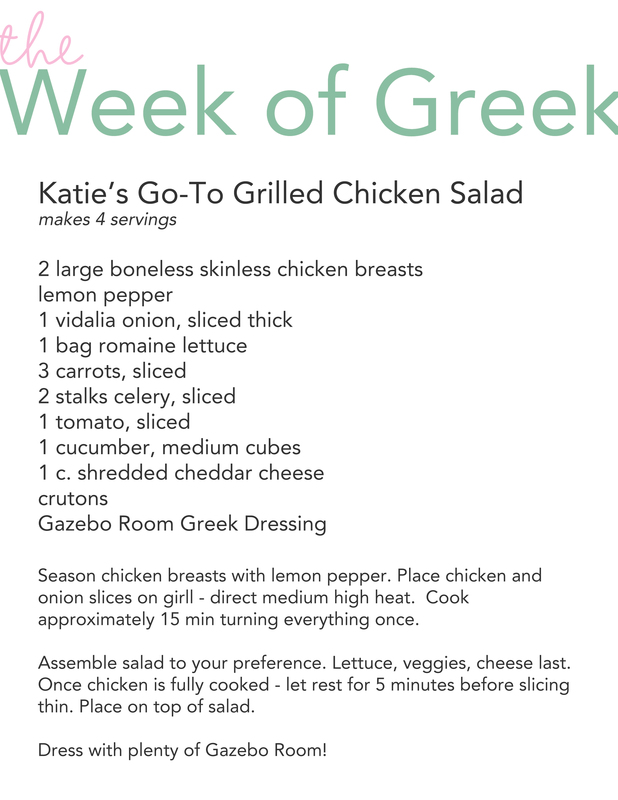 The plan this week is to show you some of the ways that I use this dressing to feed myself and my family with some fun giveaways and downloadable recipes along the way! Sound good? Ok... first up. I thought I'd start out pretty straight forward and share my "go-to" grilled chicken salad with you. Clark and I eat this year-round - but especially in the summer, when it's grillin' season. In fact, last night when we were enjoying them, he said, "Ya know, I bet this salad could win some kind of contest - it's that good." It IS that good... but that's not because of anything I do. It's all the Greek dressing people - just trust. Although I did not have all of these on hand. Which figures. This is just after turning it around 7-8 minutes. Looking GORGE. Once the chicken and onion is finished... let it rest about 5 minutes before slicing it thin. I think it just makes the breast more tender and juicy. Then place it all on top of your beautifully crafted salad and top generously with Gazebo room. Now that's a salad that the baby and I can handle! You better believe I ate every last morsel of it! And thus, I hope that you wanna share the love with the people you know too. Basically, I'm always looking for new readers! So! Here's the deal... Leave me a comment and tell me the first name and last initial of someone you are going to send to the blog - then if THEY stop by and leave a comment, I'll send you a bottle. If you get more than one new person to come and leave a comment - you'll get more than one bottle. Ya dig? I'm gonna keep this up until the stash that the kind folks (hi Steve!) at Gazebo room sent me is gone! K? Just make sure that when you leave your comment - you fill in your email address so I can reach you! And be sure to check your local grocery store for this wonderful nectar of the Gods... And if you can't find it - click HERE to order a case of your very own. When we lived in MI - this is the route I had to take!!!! My all time FAVORITE dressing...love that you're featuring it! Sending this to my sister, Jill C.
I love Gazebo Room Greek, but have a hard time finding it in the NYC area. You've inspired me to look HARDER. thanks! Your instructions are confusing me....must be my age!! This is the best dressing ever - and I do have all three kinds in the pantry. I stock up when I'm in the central PA area! Ok, I'll send a link to my sister and two friends. They are Aileen, Roberta (dollry) and Brenda (peskeypea)...fingers crossed! ok, tried to comment a minute ago and somehow the message got lost...I'll be sending a link to your blog to 3 people, my sister, Aileen O, my friend, Roberta (dollry), and another friend, Brenda (peskeypea). Keeping my fingers crossed! Just heard from Janet 'bout your blog. And I have to say I'll be looking for that dressing at my grocers. The salad sounds delish. Thanks for the recipe! I love this Dressing Debbie Burford brought me to your site....I am gonna try some of your recipes....yum! Great to have you Rhonda!